Angie Redlantern is the first to spot the boats—five abreast with men in metal masks and spears standing proud, ready for the fight to come. As the people of New Earth declare war on the people of Mainground, a dangerous era has dawned for Eden. After generations of division and disagreement, the two populations of Eden have finally broken their tentative peace, giving way to bloodshed and slaughter. Angie must flee with her family across the pitch black of Snowy Dark to the place where it all started, the stone circle where the people from Earth first landed, where the story of Gela—the mother of them all—began. It is there that Angie witnesses the most extraordinary event, one that will change the history of Eden forever. It will alter their future and re-shape their past. It is both a beginning and an ending. It is the true story of Eden. 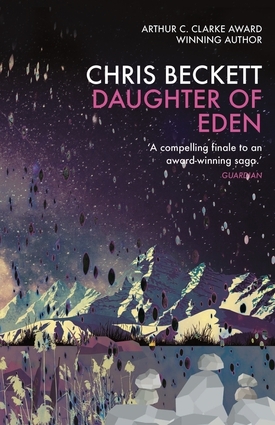 Chris Beckett is the winner of the prestigious Arthur C. Clarke award for Dark Eden and was shortlisted for the British Science Fiction Association Novel of the Year Award for Mother of Eden.